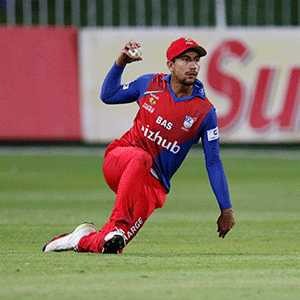 Cape Town - Bjorn Fortuin produced unbelievable figures of three for 10 in four overs to bowl the Highveld Lions to second on the CSA T20 Challenge table and leave the Knights bottom thanks to a 40-run win at Senwes Park in Potchefstroom on Friday. That mark was set up by Ryan Rickelton's fourth 20-over half-century after he top-scored with 51 (41 balls, 7 fours) for the home side. The away side were in the game for more than half the chase, until Fortuin's exploits - and to a degree three for 11 in three overs by Malusi Siboto - stunned them and left them without a victory after three matches of the campaign. After beating the Dolphins in Durban during the week, Enoch Nkwe's side did not look very good initially after losing two key wickets in the first four overs - Reeza Hendricks (0) and Rassie van der Dussen (7) dismissed with only 17 on the board. Grant Mokena (22) did his best to try and keep up with the rate, but Fortuin and then Malusi Siboto's three for 11 in three overs later on rocked the visiting side and sealed a second successive win for the home side.